No need to adjust your computer screen’s color settings, the image you see here is correct…and pretty disgusting. 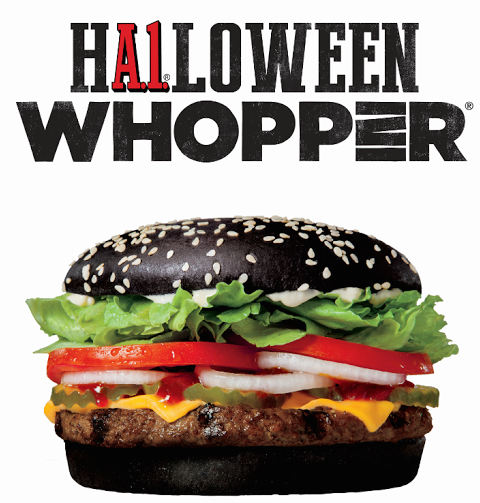 Like the black and red “samurai Whoppers” served in Japan (colored with squid ink – ew), America’s chains are offering their own version for Halloween this year. They have figured out a way to color the bun with steak sauce, which is why it’s also being called the A.1. Halloween Whopper Sandwich. In addition to the steak sauce in the bun, there is also A.1. steak sauce in the burger. “While the pitch-black bun gives the Halloween Whopper sandwich a look that may make some thing ‘hmmmmm?’ the burger’s classic A.1. flavors will have tasters saying ‘mmmmm,'” said Burger King. A regular Whopper sandwich contains 650 calories, 37 grams of fat and 1.5 grams of trans fat – the black Whopper tops that, coming in at 710 calories, 43 grams of fat and 1.5 grams of trans fat. Is that not enough for you? Then wash that black Whopper down with a seasonal Pumpkin Spice Oreo Shake – “only” 890 calories, 120 grams of sugar and 24 grams of fat for a 20 ounce serving. The black Whopper is available at limited locations starting September 28th. I think I’ll just stick to my regular food and enjoy “eating the rainbow” naturally, thanks. Are you going to be indulge?